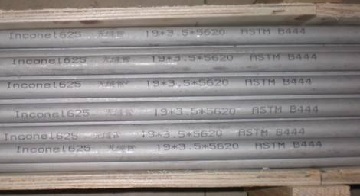 The alloy 625 tubes, which are widely used for superheater or heat exchanger tubing, are generally manufactured as per ASTM B444 (ASME SB-444) UNS N06625. It is a typical nickel-chromium-molybdenum-columbium alloy, which is commercially known as a proprietary brand of “Inconel alloy 625“. The cold-worked alloy 625 seamless tubes may be furnished in two grades of different heat-treated conditions: Grade 1 (annealed) – tubes are normally employed in service temperatures up to 1100°F (593°C); Grade 2 (solution annealed) – material is normally employed in service temperatures above 1100°F (593°C) when resistance to creep and rupture is required. Generally, unless otherwise specified, Grade 1 will be supplied. The cold-drawn alloy 625 tubes can be furnished with ground bright surfaces or pickled matte surfaces depending on the requirements of clients. Especially, small-diameter and light-wall tubes of UNS N06625 are widely used for heat exchanger or instrumentation tubing. The “small-diameter” refers to outside diameters 1-1/4″ (31.8 mm) and under, while “light-wall” refers to a tube with specified wall thickness 3% or less of the specified outside diameter. Carbon: ≤0.10; Manganese: ≤0.50; Silicon: ≤0.50; Phosphorus: ≤0.015; Sulfur: ≤0.015; Chromium: 20.0~23.0; Columbium + Tantalum: 3.15~4.15; Cobalt: ≤1.0; Molybdenum: 8.0~10.0; Iron: ≤5.0; Al: ≤0.40; Titanium: ≤0.40; Nickel: ≥58.0; all in weight percentage. The mechanical properties of Alloy N06625 Grade 1 (annealed) tubes: tensile strength ≥ 120 ksi [827 MPa]; yield strength ≥ 60 ksi [414 MPa]; Elongation in 2″ ≥ 30%. The mechanical properties of Alloy N06625 Grade 2 (solution annealed) tubes: tensile strength ≥ 100 ksi [690 MPa]; yield strength ≥ 40 ksi [276 MPa]; Elongation in 2″ ≥ 30%. The annealing heat treatment shall be conducted at a temperature no less than 1600°F [871°C]. The solution annealing heat treatment shall be conducted at a temperature no less than 2000°F [1093°C], with subsequent stabilization anneal at 1800°F [982°C] minimum to increase resistance to sensitization. Hydrostatic Test: Each alloy 625 tube (seamless & cold-worked) with an outside diameter of 3 mm and larger and with wall thickness of 0.38 mm and larger shall be tested in accordance with ASTM B829. The allowable fiber stresses for UNS N06625 Grade 1 and Grade 2 are 30 ksi [207 MPa] and 25 ksi [172 Mpa], respectively. Dimensional inspection and visual examination: outside diameter, wall thickness, inside diameter, length, straightness, plain ends, finish & surface appearance. Tension testing (ASTM E8) and hardness test (ASTM E18). One or more non-destructive tests (NDT) may be specified: PMI, ultrasonic examination (ASTM E213), eddy current examination (ASTM E426/ E571). The weight of an alloy 625 tube can be calculated using the equation: W = ( D – t ) * t * 0.0246615 * F * L. W: weight of the tube, kg; D: outside diameter of the tube, mm; t: wall thickness of the tube, mm; F: correction factor, 1.075; L: length of the tube, meter. Alloy N06625 tubes in the annealed condition are subject to severe loss of impact strength at room temperatures after exposure in the range of 1000°F to 1400°F. When used for applications designed to ASME Boiler and Pressure Vessel Codes, the alloy 625 tubes, made to ASTM B444 UNS N06625, shall be furnished in solution annealed condition. They can be applied to temperatures up to 1600°F. The values of maximum allowable stress, tensile strength and yield strength at different elevated temperatures are listed in below tables. *Temp. : metal temperature, °F, not exceeding; *MAS: maximum allowable stress for ASTM B444 UNS N06625 Grade 2 tubes, ksi. *Temp. : metal temperature, °F, not exceeding; *T.S: tensile strength for ASTM B444 UNS N06625 Grade 2 tubes, ksi. *Temp. : metal temperature, °F, not exceeding; *Y.S: yield strength for ASTM B444 UNS N06625 Grade 2 tubes, ksi.